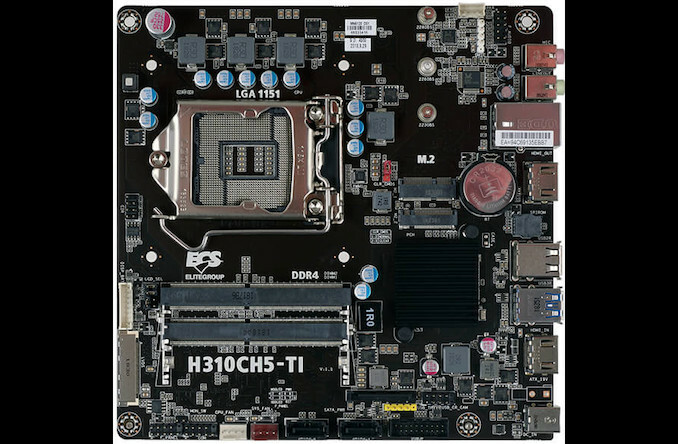 ECS has released a brand new Mini-ITX motherboard that supports 8th Gen Intel CPUs in the i3/i5/i7, Pentium and Celeron segments in the form of the H310XH5-TI. The motherboard is based on Intel's H310 chipset. Since there's no need for a souped-up VRM solution on this motherboard, there's a 4+1 phase affair present. There are 2x SO-DIMM slots with support for up to 32 GB of DDR4-2667 memory, 1x M.2-2280 slot for PCIe/SATA SSDs, 2x SATA 6 Gbps connectors, and 1x M.2 slot for a Wi-Fi/BT add-in card. I/O wise, there are 1x GbE port (Realtek 8111H), 1x HDMI 1.4 output, 1x HDMI 1.4 input, 4x USB 3.0 Type-A connectors (two internal and two external), 2x USB 2.0 Type-A ports, and 2x audio jacks. Audio is powered by Realtek's ALC662 codec and a six-channel DAC. There's also a 19VDC input for power delivery straight to the motherboard, and numerous internal headers for expansion, such as a card reader header, a webcam header, a touch board header, a camera header, and an IR sensor header, which suggest a highly-integrated system that can be more than just a small PC. This looks like an OEM board for AIO systems. Even has LVDS header, and a bunch of scattered USB2.0 headers marked specifically for Webcam, Touch and Card Reader (which also means there are not 2 but at least 5 USB2.0 available). Doesn't look too shabby (except ALC662). Not sure if it'll be available in retail for a couple of years. Their older H87 and H110 models(which look the same btw), only appeared on official ECS Ebay and Amazon stores not too long ago, which means they are probably just getting rid of leftovers. 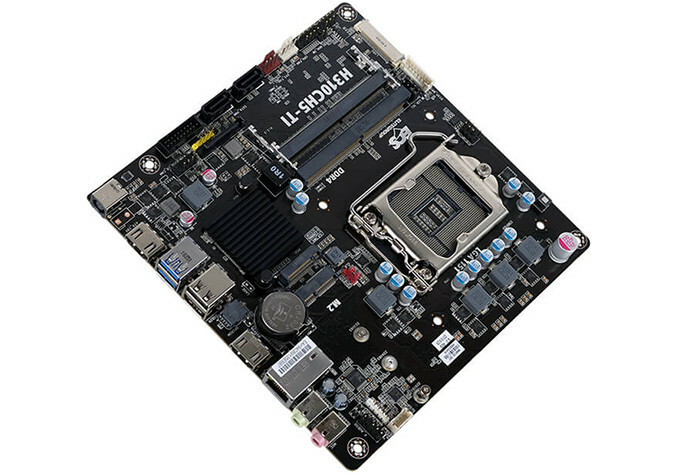 In addition to the previous post, the important bit about the form factor is that this is a Thin-ITX motherboard. Single-height IO and SO-DIMM slots on their sides cutting down on height. It's the same crap that AsRock used on some of their boards in the past. HDMI-IN is a pass-through mode, so essentially it's only useful if you have a cheap monitor with only one video input. You plug something into the HDMI-IN port, you hit the hotkey and the video signal from that device will be redirected to HDMI-out. Other than that - there is no useful functionality. You can't even record or use splitscreen mode. so essentially it's only useful if you have a cheap monitor with only one video input. Or if you have a lot of HDMI devices and a limited number of inputs and don't have a receiver or HDMI switch box. This board was designed with folks who need capture capabilities and not a ton of CPU power. It'll make for a perfect multi purpose video capture mini system. This board was designed with folks who need capture capabilities and not a ton of CPU power. It does not support capture. Just a pass-through. Basically a built-in HDMI switch, that's it. This feature may be useful on AIO systems, if a person wants to use it as a monitor. I have a 3rd gen ASUS monoblock in my office which supports this feature (motherboard most likely made by ECS too). For a regular desktop w/ shared display there are much better options (like an actual HDMI switch, or KVM). Cause this is not the first motherboard with HDMI in, and because HDMI capture requires expensive hardware. If you don't trust my word, just google a few motherboards with HDMI input and read the manual. Capture can be done in software. What part of pass-through did you not understand? There is no signal going into your PC, so there is nothing to record. What part of pass-through did you not understand? You show me where is says "pass-through" and I'll concede. Until then, it looks like this motherboard is likely aimed at streamers who want a customizable capture mini-system. You can believe whatever the f#$%k you want. I ain't gonna waste time on looking for high-res board pictures to show you that traces aren't even going to SoC or PCH.